I’m not one to buy wholeheartedly into trends. Whether in the world of fashion, food, or media, I have my perennial stalwarts that I return to time and time again, and (perhaps foolishly) pride myself on not swaying too far toward just any passing fad. You might think it would be easy, then, for me to dismiss what may be the trendiest food of our time: kale. That fluffy bundle of greens seems to beckon from every farmer’s market stand, grocer’s shelf, and even bodega crisper from here to Timbuktu, and the health and culinary worlds have been abuzz about this “super food” for some time now. However, as much as I might hesitate to admit it...I can’t get enough of kale. Friends, let me tell you why. Kale is a veritable powerhouse of nutrition; the deep, forest green hue of this power green hints at the rich concentration of nutrients held within. 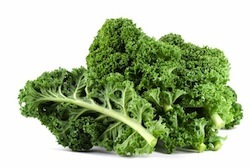 With high doses of iron, calcium, fiber, potassium, polyphenols (a type of antioxidant), vitamins K, A, and C, and even protein, kale hits all the touchstones of healthy eating. And while raw kale can be somewhat difficult for the body to digest, gently cooked or salt-softened greens retain many of the beneficial nutrients and enzymes of the raw stuff without harshing your digestive tract’s vibe. Kale could also not be any easier to prepare. Besides tossing into my morning smoothies, for almost all preparations of the super green I tend to favor some variation on the theme of kale plus salt plus acid plus oil, a combination which brings out the inherent grassy sweetness of the green and plays it against salt and tart, for a greater-than-the-sum-of-its-parts burst of flavor. When preparing any leafy green vegetable, make sure to thoroughly wash and dry the leaves before you start, especially if you’re unable to use organic greens. Kale is given an especially heavy spray of pesticides in conventional farming situations, and the many nooks and crannies of organic curly kale can trap soil and other impurities. Either way you go, a thorough scrub will serve you well. Remember to also remove the tough stem and center vein by either ripping or slicing the tender leaves away. I like to keep the veins in the crisper for use in fresh juices or sliced into stir-fries. Here are two of my absolute favorite, and achingly simple, recipes using kale. Call me a trend-follower if you must: I say kale is here to stay. Rip or cut the leaves into bite-sized (about 2-inch-long) pieces and place in a large bowl. Sprinkle with salt and start massaging! This process breaks down the cell walls of the kale leaves, releasing their natural moisture and softening the hardy greens. Make sure to toss the greens a bit as you rub to incorporate all of the salt. Massage for about 30 seconds, or until you feel the kale start to soften. Let the massaged kale rest for a minute or two before pouring in the lemon juice and olive oil. Give the salad a quick toss and serve immediately. Preheat oven to 325. Line two sheet pans with parchment paper. Rip or cut kale leaves into bite-sized (about 2-inch-long) pieces and place in a large bowl. Toss with oil, vinegar, salt and red pepper flakes, and arrange in a single layer on lined sheet pans. Bake for 15-20 minutes, stirring once halfway through baking, until crisp but not browned. Toss with more salt to taste, if desired.